This guide will walk you through the process of connecting, and testing the Rainbow Ring V2. After soldering your pin headers, connect your Rainbow Ring to the FTDI board and power it using the two aditional power pins behind LED D4. Once you have connected the Rainbow Ring to the FTDI breakout board connect the FTDI board to your PC. After windows has finished installing the drivers, find which com port it was assigned to by going to Control Panel and then Device Manager. Now you should be able to program your Rainbow Ring via the Arduino IDE. You may also connect to it from a serial terminal. Connect your Arduino to the Rainbow Ring. Since we are providing power from the FTDI board do not plug in the 5V Vcc to the I2C side of the Rainbow Ring. The only two wires you need to connect are the SDA to pin 4 and SCL to pin 5. Download the Rar file with the source code and library. The Receiver.pde sketch needs to be uploaded to the Rainbow Ring. In the Arduino IDE please select "LiliPad Arduino W/ATmega 168" from the Tools>Boards menu. NOTE: If you accidentaly load the sketch to the wrong board just start over, just make sure to choose the correct board and com port for each board. The hardware flow control will not affect the Arduino, but it is important for the Rainbow Ring, this will reset the Ring every time the serial port is opened or closed. Once the serial monitor is open for each you should be greeted by the words "hello from Arduino" and "Hello from LED Ring" This will help you identify which is which. Now you can start passing commands to the Rainbow Ring via the Arduino Serial terminal. NOTE: These sketches are provided as a guide to demonstrate the functionality of the Rainbow Ring. Please feel free to modify it or make your own sketches to interact with the Rainbow Ring. 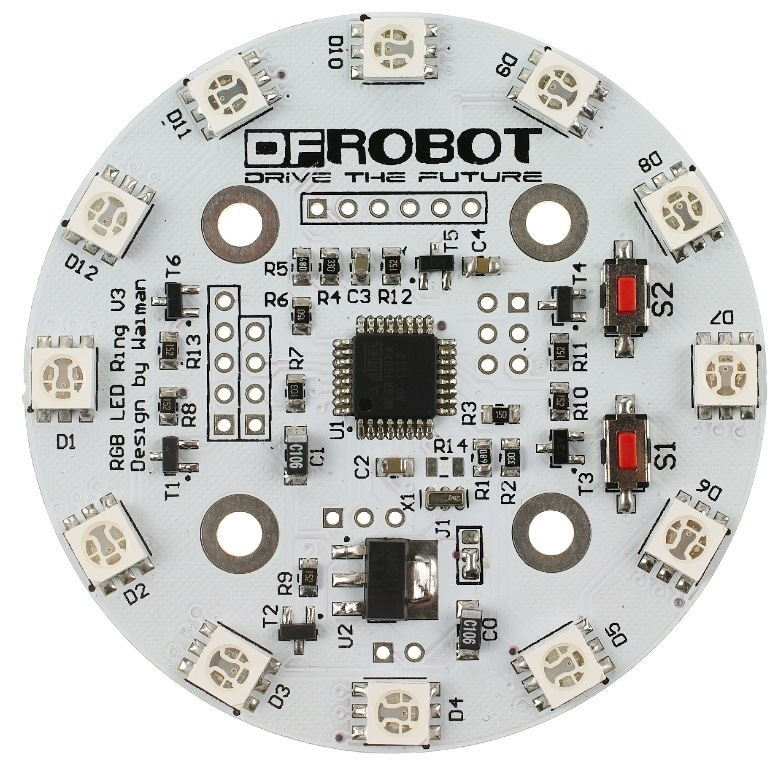 Get Rainbow Ring V2 SKU:DFR0141_ from DFRobot Store or DFRobot Distributor.